Being born in the same great year as our heroes in a half-shell, I have been feeling the turtle power for as far back as I can remember. TMNT figures ruled my toy chest, the original cartoon series ruled the TV every Saturday morning and I had several trips to see Secret of the Ooze in theaters, even though trips to the movies were rare for me as a child. But not everyone’s life has been as great as mine. Some of you might be new to TMNT fandom, so here they are, my ranking of all the TMNT movies to date. Which, bee tee dubs, is the correct ranking. There is very little to like about the first installment of the latest run of TMNT films. I can appreciate that they tried to go a new way, but my laundry list of complains of why I don’t like this film is seriously a mile long. The only reason you should watch this movie is to get an understanding of what’s to come in Out of the Shadows. There is very little to like here. 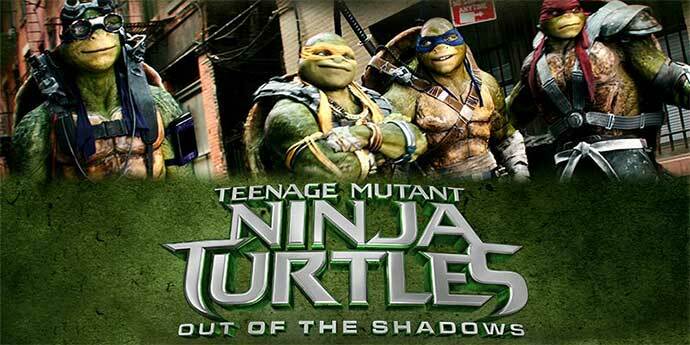 Also a pretty lousy TMNT film. Very disliked by fans and critics alike. I only rank it slightly above TMNT 2014 because they at least tried to keep it tied to Japan and the turtles mythos. It also featured the return of Casey Jones. Plus, the time travel story reminds me of the best video game of all time, Turtles in Time! This was my favorite as a kid. Lots of laugh, a little brighter than the first film and, of course. Ninja Rap. Looking back on it now it’s obvious it was rushed and is unintentionally a Gremlins 2: The New Batch, which was purposefully a parody of itself. It’s still a lot fun though, and thankfully saw the departure of Corey Feldman as Donatello. The latest film about our lean mean green incredible team just came out today and it was a major step in the right direction from the last Nickelodeon film. It was a pretty major toss up for me to choose this one for #2 or #3 and what it really came down to is that while being vastly superior to the 2014 film, Out of the Shadows still suffers from a lot of the same pitfalls. Ugly, bulky turtle design, Megan Fox as April, Tony Shalhoub as Splinter, overblown & unrealistic action scenes, among other things. OOTS did jump a lot of the hurdles the first film tripped over, but still couldn’t finish the race. What’s nice about 2007’s TMNT is that we are entering an established world. We know who these guys are, we know their story and most of the supporting cast. So let’s move on to the story. And a fresh story we haven’t seen before. A lot of the bad reviews criticized the story and plot as muddled and underdeveloped but I disagree. I felt it was a breath of fresh air. And the action and direction were fantastic. Not overblown, just right. It brought us so many cool things like Leo in the jungle, Leo fighting Raph as the Nightwatcher (you gotta see who wins), and a film where Karai actually does something! The supporting cast is filled out by fantastic voice actors while the principal cast of the turtles falls very flat. And that’s really about my only gripe. As far as the turtles being animated, this is where they looked their best. Not too cartoony, but not… grotesque. As an adult I furthered my fandom beyond the series, the toys and movies into the comics, where it all began. And that’s why I rate the first film as the best. It is truest to it’s comic origins, with the story lifted almost straight from some of the earliest issues. It’s dark and mysterious, while still being humorous. We get our first look into the world of these fascinating characters (and the origin makes sense!) We get the best portrayal and appearance of Casey Jones. It is the gold standard all the films have been striving for since it was released. And with as far as CGI has come, the turtle suits still almost look more believable to me. Plus, Sam Rockwell. Also, while these are not feature films, I highly recommend watching the animated TV film Turtles Forever and the documentary Turtle Power. These would have probably ranked after Ooze and before TMNT, perspectively, had they been feature films. Do you agree with my list? Disagree? I don’t care. Go fight on reddit if you want be a jerk about someone’s personal opinions. ← Shocking New Game of Thrones Theory!